I always start my tour mentioning the similarities between the two gardens which eventually joined to become the Halifax Public Gardens. The first is that both occupied land that was once part of the Halifax Commons. The second is that both were given ‘free of rent’ for the purposes of creating a garden and finally (and the thing that is vitally important to the first two) is that both gardens were championed by politicians. I’ve come to be interested in the anthropology of the Gardens as well as its horticultural elements. 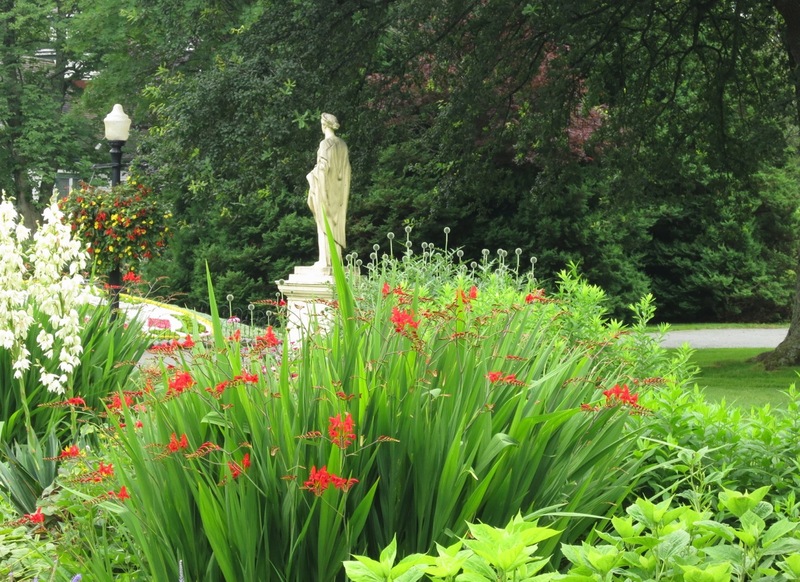 There is no better glimpse into Haligonian society in the Victorian era than to study the evolution of the Gardens and the people and mores which shaped its existence. This week I decided to photograph the streets surrounding the Gardens and came away with a new understanding of some of the characters involved in founding this wonderful space. 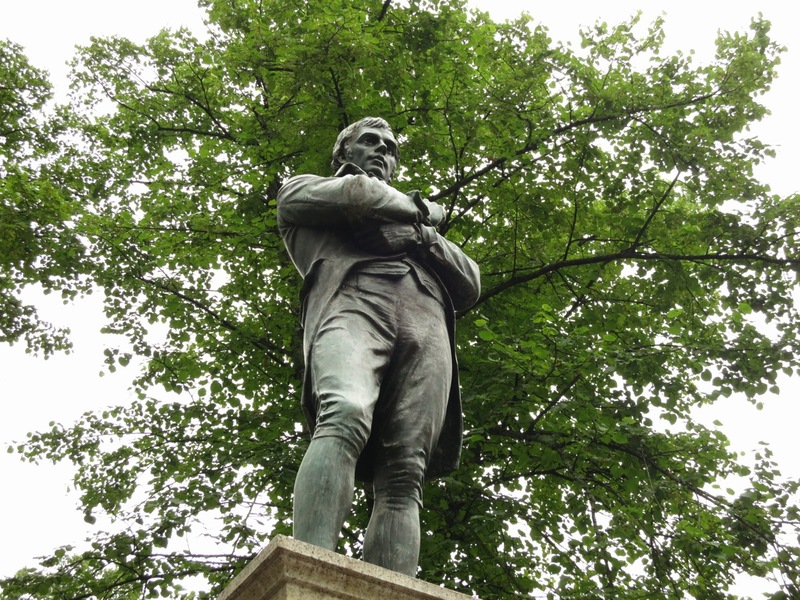 I took a stroll through Victoria Park (across the street from the Gardens) and discovered three statues of three Scots: Robbie Burns, Sir Walter Scott and William Alexander. Why I wondered? I discovered all three had been erected by the The Scots:The North British Society, the oldest Scottish society outside of Great Britain. It was a group formed to support the Scottish community in Nova Scotia. I wondered at their largest and upon further research I discovered some prominent Haligonians were members. Alexander Keiths (of beer fame) and Sir William Young (of Gardens fame – to me, I didn’t grow up here and never studied past politics). 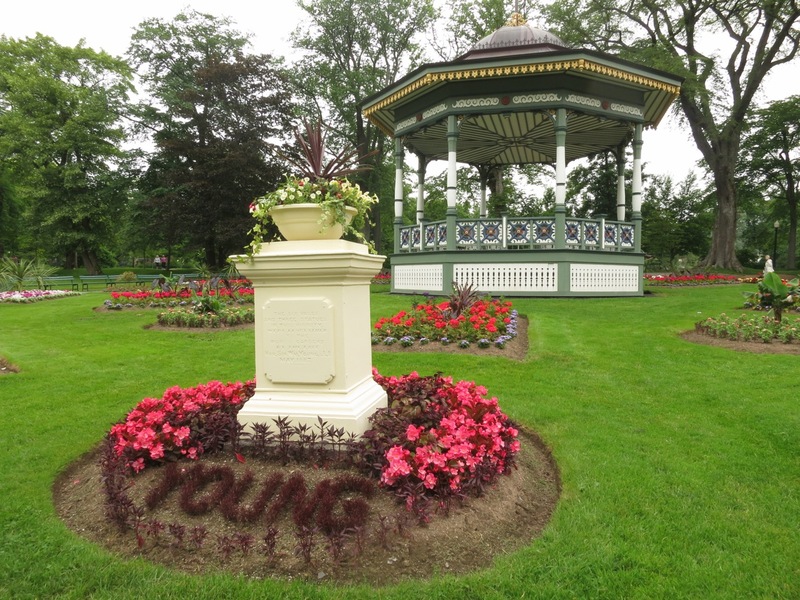 Sir William Young is the gentleman who bequeathed the three statues of Ceres, Flora and the dearly departed Diana, as well as the urns which normally grace the geometric beds around the bandstand, which are presently being restored or replaced. He was also the person who officiated at the opening of the younger of the two gardens, the original Public Garden. Though at the time he was Chief Justice of Nova Scotia he had served as the Reform Premier of the province twice. In those days Reform meant Liberal, not Conservative. 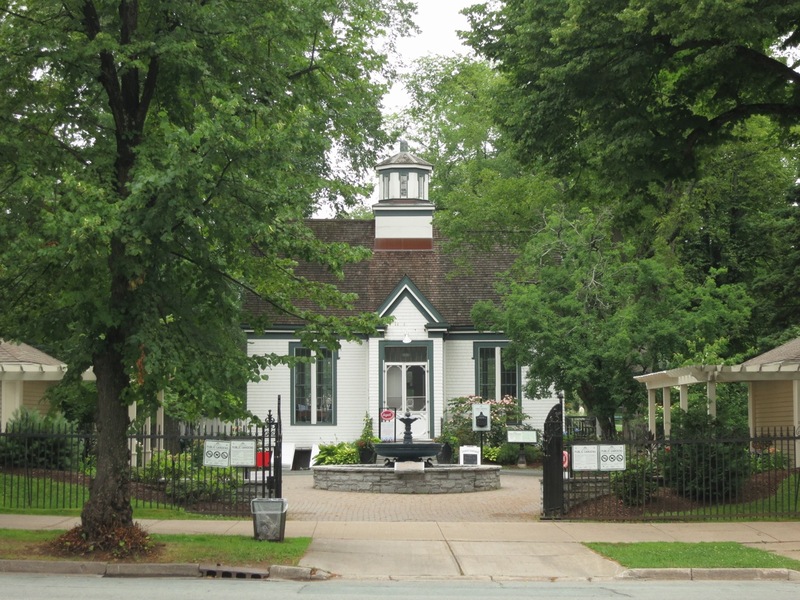 He was also a member of the NS Horticultural Society, the founders of the older of the two gardens. He had an extensive garden of his own , in fact the statues and urns once resided there. Sir Young’s father wrote horticultural articles for Agricola and must have passed on his love of horticulture to his son. There was another side of Sir Young that I wasn’t familiar with. His greatest ambition was to achieve fame and fortune no matter the cost. It was a family pursuit. He, his brother and father were said to have pursued their goals by any means including ruthlessness, hard heartedness and sometimes unscrupulous behavior. On Sir Young’s first attempt at office, running neck in neck against his opponent, he secured his victory when 150 Scotsmen armed with clubs intimidated his opponents at the last polling station. Though he wasn’t yet president of The Scots, he had already ingratiated himself into his Scottish community by helping new immigrants find land and generally working in support of the Scottish community. A nobel pursuit no doubt. The election results were later invalidated. His political career would continue to bring controversy to his name. He is attributed with introducing patronage into government, and to making religion the deciding factor in politics during the late 1850’s. By all accounts he was a brilliant strategist but also had a penchant for following the path of least resistance and to avoid the onus of decision-making. Not because he wasn’t up to the task, but because he couldn’t then be held responsible for bad outcomes. His appointment as Chief Justice was no less controversial though Sir Young would achieve his highest ambition in 1860. His judgements from the bench were known more for their show rather than for their substance, and he was known to criticized juries for not convicting the accused when he though there was sufficient evidence. In the end Sir William Young achieved his goals. He died with a substantial fortune, and despite his notoriety in business and politics and his unfailing self-interest, he achieved fame through his charitable deeds and largess. He was governor of Dalhousie University for 42 years and was its greatest benefactor in the 1800’s. 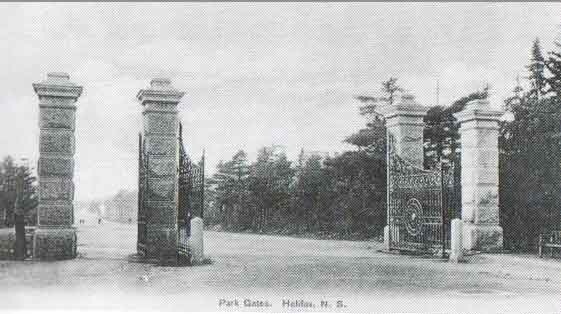 After successfully negotiating a 999 year lease from the crown (instead of 99 years) for Point Pleasant Park, he donated the gates at the Young Av. entrance, and paid for the paving and ornamentation of Young Av. He also established the Sir William Young Benevolent and Charitable fund with $100000.00, the interest of which went to ten societies he had an interest in. Altogether he left 57% of his estate to charity. Pretty generous. So I bit into a shiny apple only to find that there were worms inside. Yet again I learn that no one is good or bad. Humans are multi-faceted creatures and we all have our flaws. And things fundamentally don’t change. I can’t ignore what I learned about him and how that has changed my perception of him, but neither can I ignore the fact that many of the things that I or my community value, came about because of him. All copy and images (except for the old postcard- hover mouse for credit) copyright © Serena Graham-Dwyer, 2013. If you wish to use any part or whole of an image, in any manner, please contact us. 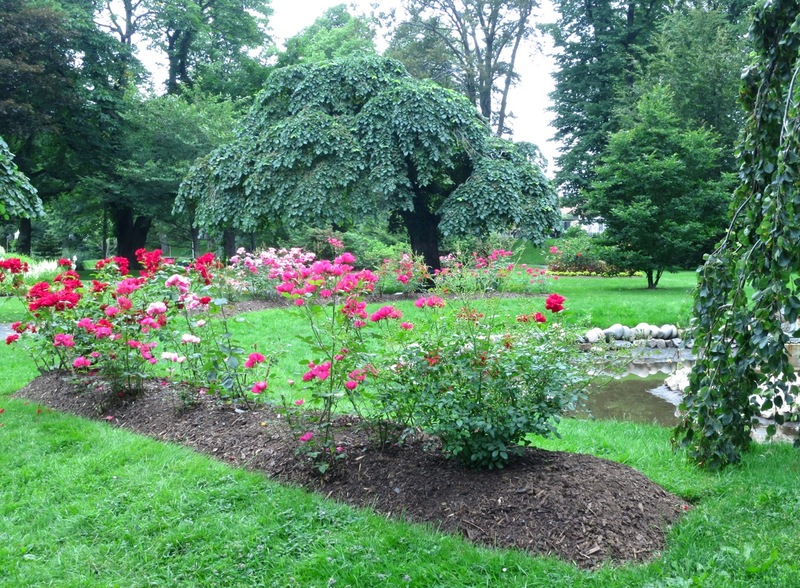 This entry was posted in Halifax Public Gardens, History, photo tour and tagged carpet beds, Halifax public gardens, NS Horticultural Society, Public garden, Sir William Young, weeping european beech by friendsblog5665. Bookmark the permalink. Thank you for sharing these beautiful photos! I am hoping you can help me find out the name of a flower growing at the Gardens, right outside the coffee house. It sits exactly to the right of the stair case that faces the gazebo. It is purple in colour, and consisted of small and larger flowers in a cluster.